STACT Wall Mounted Wine Rack - Modern Wine Storage! The STACT wine racking system is a ‘space-saving modular wine storage panel’ which allows you to store wine on your wall! STACT is an interior décor piece that stores wine in a beautiful and effortlessly way in what seems like mid-air. 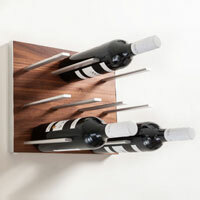 The STACT wine racks were brought to life by 2012 ICFF award-winning designer Eric Pfeffier. STACT is modular, flexible and sleek racking system that has never been seen before. It’s the perfect way to enhance your space and celebrate your wine collection all in one go. STACT offers the best balance of simplicity, usability and style. The minimalist design is infinitely expandable, letting you the user to create your own look to fit any space or décor around the home or in a bar environment. If you are looking to store your own wine, either for your home or own bar/restaurant then our wine storage guides can help. Why use the STACT Wine Rack System? -Premium furniture grade wood, veneered & piano lacquer. Each STACT wine rack is measured at 288mm in height, 364mm in width and 188mm in depth which includes both the wooden back and aluminium prongs. You’re able to store STACT next to each, this will in turn increase the capacity of the rack as the side prongs can then work together to create an additional bottle space. Infinitely expandable – Ideal for all wine drinkers, from casual to connoisseur, it works just as well whether you have 9 bottles or 9000 bottles in your collection. The patent-pending modular design grows as your collection evolves over time, so you’re able to build one at a time. Modern Aesthetic – Enjoy and celebrate your wine collection with the focus on the bottle. Each bottle sits comfortably in its own space, as if it’s suspended in mid-air, securely cradled in a place of prominence. Uniquely Versatile – STACT is all about personalisation, adding your influence to any space. Create a statement with your wine and instantly make your mark on any room. The STACT wine racks have taken the USA by storm since there release in 2013. Here at Wineware, we’re delighted to be the first online stockists in the UK to take this beautiful wine racking system. Click here to view more information regarding the STACT Wine Racking System. Please note: Stact wine racks are now not available at Wineware, however please see VinoWall Wall Mounted Wine Racks as an alternative.